COME AND FISH HATTERASCAL STYLE!!! The Hatterascal is a 30′ custom carolina boat. An excellent fishing boat was constructed by Mike Scott at Scott Boat Yard in Buxton. 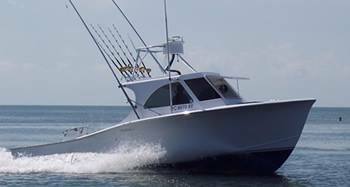 Equipped with a powerful 350HP diesel engine to get us to the fishing grounds easily. One of the best features is there are 3 different steering stations to allow control of the boat regardless of which side of the boat the fish are located. The Hatterascal has a cabin to get out of the weather and contains a bathroom for convenience. Equipped with top of the line Penn light salt water fishing tackle to guide those fish to the surface and into the ice box.